DENVER, CO – (2 October, 2017) – Pure Energy Minerals Limited (TSX VENTURE: PE) (OTCQB: PEMIF) (the “Company” or “Pure Energy”) is pleased to announce positive initial results from the geophysical exploration program at its Terra Cotta Project (TCP or “the Project”) located on the Pocitos Salar in Salta Province, Argentina. Preliminary reviews of the geophysical data show extensive zones of high electrical conductivity that may indicate the presence of correspondingly high-density brine. The geophysical survey delineates a central basin that is 18km by 9km oriented along a northwest-southeast axis. The technical team interprets the basin to be filled with clastic sediments and evaporites that appear to be saturated over considerable thicknesses. Results from the geophysical survey combined with data collected during a surface-sampling program, which is currently underway, will be used to select targets for an upcoming drilling program. The geophysical exploration program consisted of a Vertical Electrical Sounding (VES) survey that included 63 points at nominal 1-kilometer spacing along five transects shown in the figure to the right. The transects span Pure Energy’s 13,000 hectare mining concession on the Pocitos Salar. Conhidro S.R.L., a hydrogeological consultancy based in the city of Salta, Argentina, performed the work under contract to Pure Energy. The VES method is widely used to identify zones of low electrical resistivity (high electrical conductivity) in the subsurface. Zones of relatively high electrical conductivity are often portions of an aquifer with correspondingly high brine concentrations. Conhidro’s team of geophysicists and hydrogeologists constructed five east-west cross-sections and one north-south cross-section using the data collected during the geophysical survey. Each of the cross-sections showed zones of high electrical conductivity located in the center of the salar at depths ranging from the surface to over 400 meters (1,300 feet) below ground surface. The high-conductivity zones are interpreted as brine-saturated, evaporite-related clastic facies. Thin zones of higher electrical resistivity (lower electrical conductivity) near the surface are interpreted to be alluvium or other sediments that are either dry or bear fresh-water. Deeper zones of higher electrical resistivity are likely related to bedrock or halite units. The zones of high electrical conductivity extend beneath the shallow alluvial fans in the western portions of the TCP properties. The cross-section from VES Line 4 shown below illustrates the interpreted results from the geophysical survey. The highly conductive material shows up as warm red and orange colors, which are interpreted in this section to extend to over 400m below surface. Interpretations of basin stratigraphy and margins are shown in blue. Pure Energy Minerals is a lithium resource developer that is driven to become a low-cost supplier for the growing lithium battery industry. The Company is developing the Clayton Valley (CV) Project in Clayton Valley, Nevada. The Company is also exploring a major new lithium brine project in the Lithium Triangle of South America, the Terra Cotta Project (“TCP”). 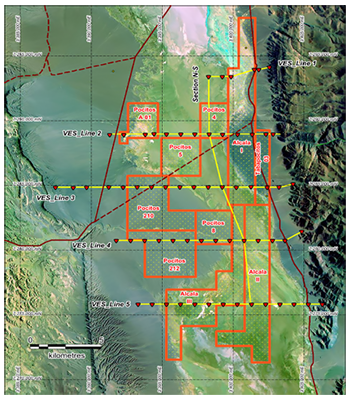 The TCP is located on Pocitos Salar in Salta, Argentina, where it enjoys some of the best infrastructure and access of any lithium brine exploration project in Argentina. The information in this news release contains forward looking statements that are subject to a number of known and unknown risks, uncertainties and other factors that may cause actual results to differ materially from those anticipated in our forward looking statements. Factors that could cause such differences include: changes in world commodity markets, equity markets, costs and supply of materials relevant to the mining industry, change in government and changes to regulations affecting the mining industry. Forward-looking statements in this release may include statements regarding planned test or exploration work, future exploration programs, operation plans, geological or geophysical interpretations, and mineral tenure issues. Although we believe the expectations reflected in our forward looking statements are reasonable, results may vary, and we cannot guarantee future results, levels of activity, performance or achievements.